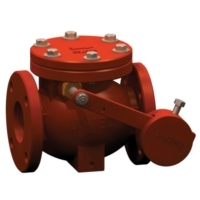 The United Model 7700 Swing Check Valve is manufactured in strict accordance with AWWA C508 Standard. The heavy duty body is of ASTM A126, Class B cast iron, Fusion Bonded Epoxy Coated with DuPont Napgard® powder, Certified to NSF-61. Bonnet bolts are of Type 304 Stainless Steel (standard), offering the ultimate in corrosion protection. Internal gaskets and seat rings are of NBR Rubber. The Clevis Pins and Hanger Shafts are of Type 304 Stainless Steel to provide long lasting service for water, sewer, or wastewater applications. 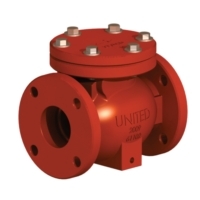 United Model 7700 Swing Check Valves are available with flanged ends, in standard configuration. Also available with Lever & Weight or Lever & Spring. 3. Maximum working pressure/temperature: 200 psi at -29°C to 64°C (-20°F to 150°F). 6. Installed with standard flange accessories (AWWA C110). 8. Meets all requirements of MSS SP-71.